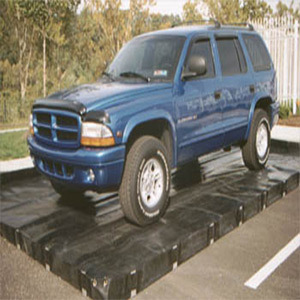 Our Water Containment Mat will enable the mobile auto detailer or car wash operator to wash cars anywhere and comply with EPA regulations. 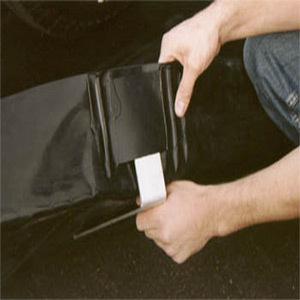 These mats are made of tough 40 mil heavy-duty polyethylene material, don't be fooled by cheaper vinyl models that will not hold-up even under normal usage. 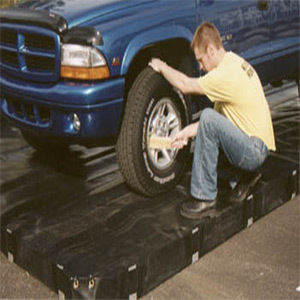 These mats are actually made in much larger sizes for the trucking industry to contain potential hazardous materials. Car Wash Mat shown above is actually 13' wide x 20' long. Most popular size is 10' wide x 20' long. About 65% of the wash water ends up in the mat, the remaining water is evaporated while drying the vehicle. We can custom make any size mat you want. This model features 6" brackets to support the berm so water is contained. Average set-up time is 10-15 minutes. Weight of the mat is 65 lbs. Contact us for additional information and for shipping costs. This is a Special Order Item and is non returnable, so be sure you want it before you place your order!